The Boots Baby Event has started and we just love baby and toddler bargains. Saving money on those essential items is always good, so it's worth checking out this discount event. 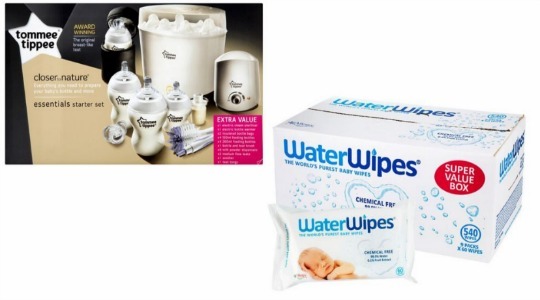 Whether it's nappies, wipes or an electric steriliser you need, Boots.com have it in their Baby and Toddler Event. We think this Tommee Tippee Closer to Nature Essentials Starter Kit* is an absolute steal. It was £140 and is now only £60. Here's what is in it: an Electric Steriliser, electric bottle warmer, TWO insulated bottle bags, FOUR 260ml bottles with slow flow teats, FOUR 150ml bottles with slow flow teats, a bottle brush, SIX powder dispensers, TWO medium flow teats,a soother and teat tongs. Other great deals include: LittleLife Toddler Wheelie Duffle Ladybird* was £39.99 now £19.99, Waterwipes Super Value 9pk Box* was £19.99 now £15, any TWO Mega Boxes of Pampers* for £20 instead of £15 each and 'buy one get one half price' on Mini Mode Clothing* plus FREE gift when you spend £20+. You can Click and Collect your Baby bargains for FREE from a Boots store near you or pay £3.50 to have it delivered to your home.